I bought the bike in 1998. A mate of mine & I drove to Sydney to pick it up. It cost $1500. 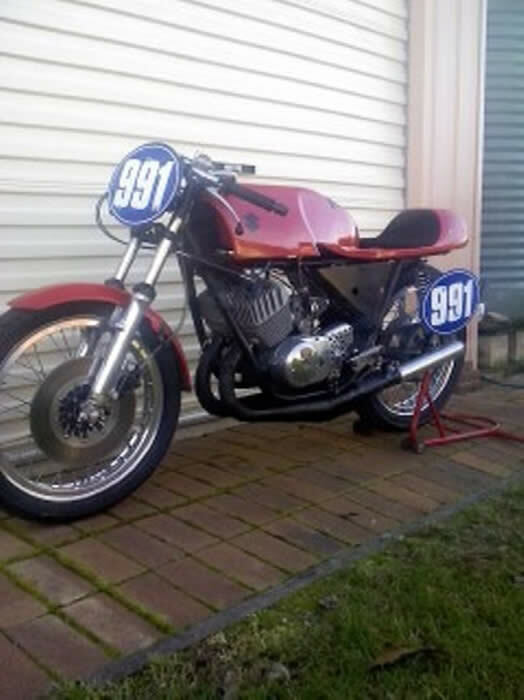 The bike was built by a Rick Roberts of Sydney who rode it at Eastern Creek and he also made the expansion chambers for it. I joined QEMSC in 1998 and my first run was Lakeside 1999, the total cost of the race entry back then was $35.00. I rode it in the 2000 Willowbank championships, quite a few other championships and the local QEMSC annual rides. The bike’s comp number was originally 77, now it’s 991. I traded the bike in at a Toowoomba dealership but really regretted it. I ended up buying the bike back from them in June of 2007. It badly needed repair on the top end and frame because of the ‘work’ that had been done on it. My current project is a basket case. BSA B26 1938 350 OHV. Any info that I can get on this to make it race ready would be great. *Thanks to Greg Kenzig (R.I.P. 2007). You were a great help, mate.